Peel and mince onion. Wash yellow and green bell pepper, remove seeds and finely dice. Pluck parsley leaves from the stems and finely chop. In a large frying pan, heat olive oil over medium-high heat. Add onion and sauté for approx. 2 min. Add yellow and green bell pepper and sauté for approx. 3 min. more. Reduce heat and add canned crushed tomatoes. Season to taste with salt, pepper, and sugar. Add chili flakes, stir to combine, and let simmer for approx. 5 min. With a cooking spoon, create hollows in the pepper-tomato mixture and crack an egg in each hollow. Simmer for approx. 1 min., or until eggs are slightly set. Then, stir eggs in circular movements, distributing them around the pan. Simmer for approx. 5 more min., or until eggs have set. 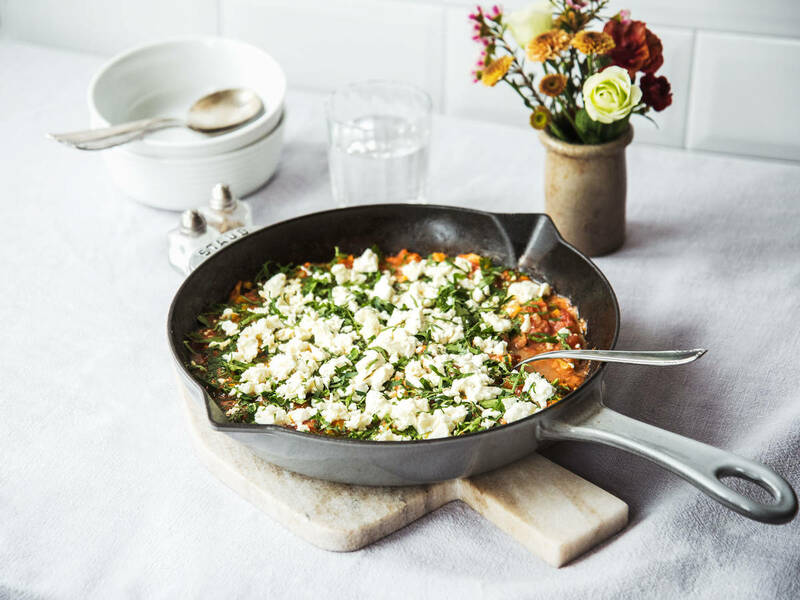 Crumble feta over and garnish with chopped parsley. Enjoy with fresh bread!